Beef Bhuna is a must item in Bangladeshi cuisine. Beef Bhuna goes well with roti or paratha. I cook beef here in kala bhuna style for that beef needs to marinate overnight which will take less time to cook. Also needs thick base non stick sauce pan with lid. 1. Marinate beef with yogurt, ginger and garlic and keep it in refrigerator overnight. 2. Heat the pan with oil in medium high and fry the onion till it becomes golden. Take off the fried onion and keep aside. 3. Add the beef in same pan with salt and rest of spices except cumin and stir it. 4. Mix all spices with beef well and cook it under closed lid till the beef becomes dry. 5. Stir well and add ½ cup of water. Cook again under closed lid. 6. Repeat this process (stir well and add ½ cup of water and cook again under closed lid) till meat becomes tender. I like to cook till flesh comes off from bone. 7. Beef bhuna will take to cook about 1.45-2 hrs. 8. Add fried onion and cumin and stir it. Turn off the heat. 9. 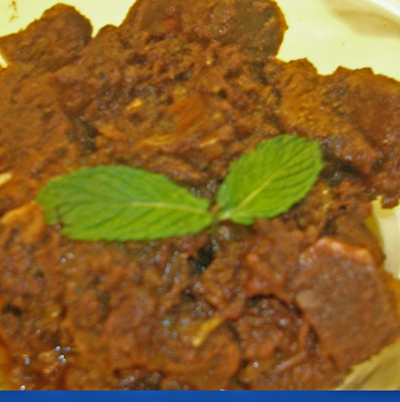 Beef Bhuna is ready to serve with roti, paratha or naan. Hi! so you are our bride (Bangladeshi). As you know there is only way to go man’s heart and it is through stomach. Try with easy recipe. try this one https://www.banglarecipes.com.au/fried-prawn/. If you need any help just give me buzz. I will love to help u.Thanks. How much yogurt should I use. I didn’t see it in the list. It is 2nd on the list . . 3 tablespoons yogurt. Thanks. My husband is Bengali and I am Midwestern (US). I’m trying to cook for him and I’m wondering what temperature I should keep the stove while cooking the beef–still at medium high or lower? I’ve had it at medium for 30 minutes and the beef still has a lot of liquid (probably from the yogurt marinade). pls. Mention the heat/flame setting for each step.